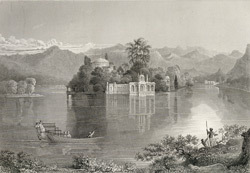 Engraving of the Palace of Jag Mandir on Pichola Lake in Udaipur, by Edward Francis Finden (1791-1857) and Patrick Young Waugh (1788-1829). Plate 8 from James Tod's 'Annals and antiquities of Rajast'han or the Central and Western Rajpoot States of India' published in London in 1829. Udaipur is the new capital of the Mewar State (Chitor was sacked in 1567) and was founded by Maharana Udai Singh (ruled 1567-72) of the Sisodia Rajputs. It is located on the east bank of Pichola Lake and the town is dominated by the main royal residence in Udaipur, the City Palace. On the lake there are numerous other palaces built on small islands that were used as summer retreats and pleasure pavilions. Construction began on Jag Mandir, seen in this view, in 1551 and was completed under Maharana Jagat Singh I (r.1628-1652). The Gul Mahal, the earliest and largest part of Jag Mandir, is a small sandstone pavilion with three circular domed chambers, one above the other, entered through a columned hall. Two marble chhatris with sloping cornices rise above the main facade.